TTN was invited on the maiden voyage of Norwegian Cruise Line’s newest vessel Norwegian Bliss, when she set sail from Bremerhaven, Germany, to South Hampton in the United Kingdom. 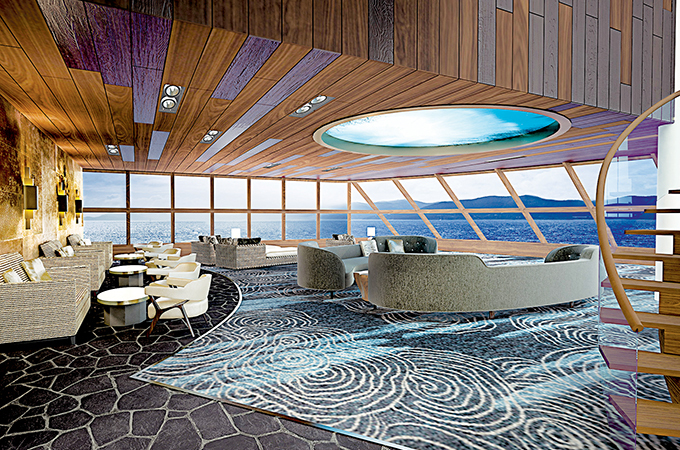 The third of Norwegians’ breakaway class and the 16th ship in the Norwegian fleet, Norwegian Bliss, the first cruise ship custom built with features and amenities for an Alaskan cruise, has lived up to Norwegians resort-style cruise vacation offering. Nick Wilkinson, vice-president and managing director for UK, Ireland, Middle East & Africa, Norwegian Cruise Line, told TTN: “The launch of Norwegian Bliss is an important milestone in our evolution as a company. We now have 16 ultimate floating resorts. We offer 27 high-quality, cosmopolitan dining experiences competing with the best cities in the world. The Broadway, West End shows are included in the cruise fare as are the activities from go-carts to laser tag. It’s about creating that ultimate resort linking the land and the sea, taking away those barriers by guaranteeing a change of scenery every day. The ship homes 2,043 guest staterooms (capacity of 4,004 pax) includes 400+ suites, villas and penthouses. There is a wide variety of accommodations and price points on offer and especially for the Middle East market, with The Haven by Norwegian. The Haven offers ultra-luxurious suites with privacy, personalised service and an array of complimentary amenities including its own private restaurant and much more. TTN was hosted in one of the ship’s 308 mini–suites with a balcony. The cabin was very spacious with a comfortable king-sized bed, a sofa (that converts to a bed) with a spacious bathroom with two sinks and sizeable shower. This cabin can accommodate up to four passengers, so a lot of room for this single traveller, and sitting on the balcony at sunrise and sunset was magical. There was also a kettle for coffee and tea, a television with satellite channels and USB charging points so no need to carry adaptors. With 27 dining options, 14 bars and lounges and two observation lounges, (including Norwegian’s first Starbucks) you won’t go hungry or thirsty and with all the entertainment, Norwegian Bliss provides you with more things to do than you have time for. As I only had two nights on the ship, I was only able to try Los Lobos, an upscale Mexican restaurant, one of the ship's a la carte restaurants and The Manhattan Room, one of the complimentary dining experiences reminiscent of a private New York City supper club with floor to ceiling panoramic views. Both offered a wide and varied menu and Los Lobos its signature Mexican drink (which happens to be one of my favourite). Norwegian Bliss is also the only ship with a dedicated smoking area in the casino. With the 2006 Tony Award winner for Best Musical, Jersey Boys headlines in the Bliss theatre in its full broadway production, and the specially produced for Norwegian Bliss Havana, Cuba’s music and culture, journeying back in time to its 1950’s heyday with fantastic costumes & set designed by famed Cuban-American designers Ruben Toledo and Isabel Toledo are highly recommended (depending on your taste). These shows along with an open-air laser tag course, two multi-story waterslides, and a two-level electric race track, there’s no shortage of fun to be had on board Norwegian’s newest ship. For those travellers with children, there are three clubs Guppies, Splash Academy and Entourage keeping all ages from babies to teens entertained and, depending on the age, out of parents’ hair! Following her maiden voyage, Norwegian Bliss made her passage across the Atlantic Ocean and arrived in the US on May 2 where she began her inaugural tour with events in New York City, Miami and Los Angeles. She then begins her Alaskan cruises, for which she was specifically built, from June 2 and continues through the summer. In the fall of 2018, she will cruise the Mexican Riviera and Los Angeles and from Winter 2018, the Caribbean from Miami. Fall/winter of 2019, she will cruise from New York City to Florida, the Bahamas and the Caribbean.